Applications are now open for the 2019 module. This exciting course is the only one of its kind in the UK. Our Application Guide offers further specific advice on making an application. For the programme content and structure, please review our Masters Module QA 2019 . This fully online Masters-level module is designed for teachers who aspire to lead the way in teaching this complex and disturbing history. ‘The Holocaust in the Curriculum’ is a cutting edge programme of academic study, intellectually rigorous, but wholly accessible. It is an exciting, challenging and creatively designed course that engages students in key issues and debates surrounding the subject. Following on from publication of the Centre’s latest research report into what students know and understand about the Holocaust this module provides opportunities to work with the data and key findings of this world-leading research, which is already informing policy on the future of education about the Holocaust in this country. During your studies you will engage in a variety of creative tasks, employing strategies that analyse aims, rationale and possibilities for Holocaust education and critically contemplate its challenges. The course engages you in the difficult questions of: the subject’s aims, its definition, the nature of disturbing histories, identifying and challenging misconceptions, subject specific dimensions, and the use of artefact documents and the debate surrounding the use of images in class. It certainly gets you thinking! You will be exposed to fascinating archival material (from centres such as United States Holocaust Memorial Museum, Shoah Foundation, Jewish Museum and Wiener Library), the work of leading historians and educations and engage in lively online debate about issues relating to the field. Taking part in the module will equip you with an in-depth understanding of Holocaust education, strengthening your academic knowledge and professional practice in teaching and learning. The module supports teachers to improve their practice and aims to guide them through some of the tensions and sensitivities around teaching the Holocaust in the classroom today. It keeps you completely up to date with the latest emerging knowledge about the way children come to understand and make sense of this complex subject and also seeks to help support teachers in developing a coherent whole school approach to Holocaust education. You will emerge from the course confident in your knowledge and able to express yourself orally and in written form. You will also have shaped your thinking towards best pedagogic practice and be better equipped to lead the way forward in Holocaust education in your school. Some of our alumni now are the leading their school’s UCL Beacon School Programme in Holocaust Education. Others have registered for a full MA transferring the 30 credits gained or are perusing a PhD in Holocaust education. The module is awarded special funding. Applicants who have previously attended one of the Centre’s CPD courses in Holocaust education and meet the other entry requirements for the module will be allocated a funded place*. Funding for Masters courses is rare and that is why we are particularly pleased that Pears Foundation and the Department for Education are making this possible. The module is taught completely on-line so you do not have to travel anywhere. All that is needed is access to a computer and the internet. The course begins in May 2019 and the teaching element lasts for eight weeks, with a week’s half-term break in between, followed by a period of independent study that focuses on an assessed writing task. The course does demand your time, but its short duration and compact structure does however make it manageable. It is designed to help busy teachers to still manage their professional and personal lives while studying. We find that our students complete the module without too much difficulty while holding down a full time job and maintaining family responsibilities – some even give birth during the course and manage to keep up with the work! You are supported throughout your studies by a personal tutor. In addition the tutors on the module support you in the process of assignment writing and submission by teaching you how to structure complex academic argument enabling you to make an informed case for Holocaust education conversant of the challenges that the subject evokes. The course invites you to think critically and embed opinions in research, academic literature and analysis of your own teaching experience. As a student of UCL you will also have access to the variety of student support services available throughout the University including free support from the UCL Institute of Education’s Academic Writing Centre. With both online and face-to-face services designed specifically with teachers in mind, this centre provides an additional level of support for those students who need it, including those returning to study after a period of absence. 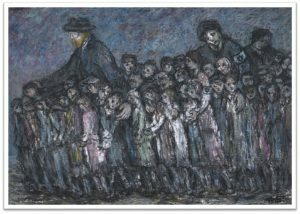 Detail from Deportation of Korczak Orphanage Warsaw Ghetto, 1942, by artist Itzchak Belfer.